Squirrels may be cute and fun to watch at their antics, but there is no humor involved, when they start to shred and destroy your outdoor furniture cushions. 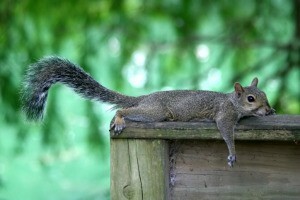 This is a guide about squirrels damaging outdoor furniture. I have a problem with squirrels tearing my lawn cushions apart. What can I do to stop this? Can I make a homemade squirrel repellant and if so can I have a recipe? Bring your outside cushines in the house at night. If you buy bags of corn and sunflower seeds this will keep them away from the chairs. Feces and swing cushion torn up.is this s squirrel?raccoon, or skunk. We have seen all by our yard. I took an old pillow, made a slit down the middle, fluffed and separated the stuffing. The squirrels stopped trying to tear into my cushions and went for the stuffing. I need help on how to stop squirrels from tearing up and taking out the insides of brand new cushions on outdoor furniture. I had birds and squirl all over my deck and pooping all over. So a friend told me to get a rubber snake and put it on the deck you have to move it every few days. But I found a real lookin one in the garden department at Walmart. Never had probelms again. If it is the blow up type make sure to ancor it down mine blew away several times. did you get any help? they are tearing up my cushions. I live in Kaufman. I had to remove the cushions and take them inside! I have the same problem. I bought a can of squirrel repellent at Ace Hardware, but it stains the cloth orange. (Guess it is only meant for plants, etc.) I wish someone would let us know what we can do! Is there a spray I can use on outdoor cushions that won't discolor them or harm my 6 lb. dog? Your pup can help in the squirrel be gone quest. Next time you brush or groom the pup, put the fur in a cheesecloth pouch and put one or two under each cushion; keep them flat so as not to make the cushions unbalanced. The smell deters the squirrel from climbing on the cushions and no harm to the pup! Replenish fur at each grooming! What can I spray on the cushions of my porch swing that won't stain them, but will prevent the squirrels from ripping the cushions and taking the stuffing for their nests? Keep dryer lint in a coffee can or two; and set it out here and there for them to use instead!